This is an excerpt from a short story I wrote after my town was visited by 17-year periodic cicadas, back in 2004. Since another brood has just emerged this year, I thought it would be good to share. 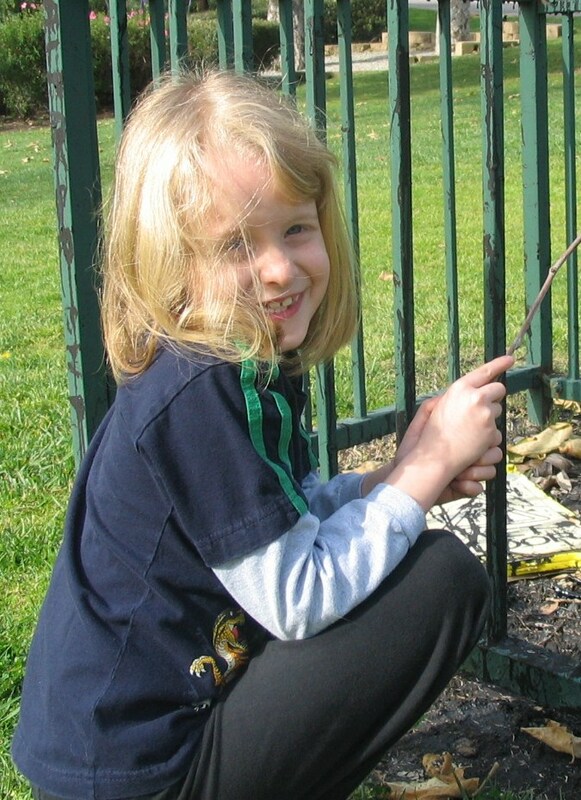 Annie waited for her father in the shade of the dogwood tree. He would be home from work soon, so she sat on the concrete steps leading to her front door, listening to the cicada noise. The insects made a sound that was remarkable to her five-year-old ears. She listened closely. Sometimes it was a soft, background whir; sometimes it was a loud, throbbing buzz. Sometimes it was both, the sounds layered one on top of the other, creating a two-tone droning chorus of insects. The buzz undulated in and out with a sonic frequency only the bugs understood. The whir, though, was constant, continuing deep into the night long after the buzz had died down. Annie watched the cicadas around her, on the tree branches, the bushes, the blades of grass. There were always a few in the air, flying awkwardly, seeking a better place, one less crowded perhaps, or maybe one bright with insect life. When a cicada would land at her feet, she’d hold her finger out to let it crawl onto her hand so she could bring it close to her eyes. They did not seem to be very smart, she thought, as each would just stand on her hand or move slowly up her arm. With a bulky body, black triangular face, round red eyes, long, orange-rimmed transparent wings, to her they were both fascinating and a little scary. She’d let them crawl on her bare arm a few seconds, until she could no longer stand the prickly little insect feet against her skin, then brushed them off and watched as they flew on to wherever they needed to be. On the steps in front of her, cicadas were scattered randomly here and there. It was hard to tell the live ones from the dead until one moved. There were so many dead. Some never emerged completely, expiring while only half out of their skin. Others appeared to be normal, except they were dead. From where she sat, Annie could see the surface of the street that ran past the end of her driveway. There, hundreds of bugs lay smashed by passing cars, their bulbous bodies flattened, their lifeless wings fluttering in the wind like feathers or leaves or maple tree seeds. But even with so many dead, there were still enough alive to make the noise that surrounded her, that filled the hot, humid air. It was impossible for her to know just how many cicadas were in the trees around her. She imagined it was one creature that produced the sound, distinct from the goofy black bugs crawling around at her feet. It was hypnotizing, and unbearable. She closed her eyes and put her hands over her ears. Annie felt something touch the top of her head and she flinched, swatting with her hand. She then opened her eyes to find her father standing on the step in front of her, stroking her hair. She took her hands away from her ears. “Hi, bug-girl,” he said, smiling. She was quiet for a moment, watching a cicada crawl toward her father’s shiny black shoe. She stood up and instinctively sought his hand with hers. Together, they walked up the remaining steps to the front door of the house, threading their way through the insects. The sailplane was wonderfully quiet, with just some wind noise as we sliced through the air, soaring high above Maryland’s Eastern Shore. The instructor told me how to steer and then the controls–a joystick between my knees and two pedals to move the rudder–were mine. At first, I enjoyed the view and the feeling of being suspended far above the ground on the plane’s wings, without an engine to intrude. Soon, though, I realized that I didn’t feel like I was going anywhere, and there was no sensation of speed. If I were actually trying to travel, the flight would be rather boring. Then the instructor, asking me to look down, had me try to locate the airfield. I looked and looked, but I had no idea where it was. From our altitude, the world appeared so completely different and the landmarks unrecognizable. I couldn’t have been more lost. Perhaps the instructor felt I was less than impressed with the flight, because then he suggested we try a “wing-over.” This is a maneuver where the plane dives to gain airspeed, then the pilot turns up sharply and banks the plane so that it topples sideways as if balancing on one wingtip. Wanting to make the most of my gift glider ride, I agreed. But as he took me through a series of three or four wing-overs, I felt nauseous and thought I was going to pass out. I wanted to get off. “That’s enough of those,” I said into my headset, struggling to stay oriented and conscious. It was a sad dose of reality for someone who once wanted to be a pilot. 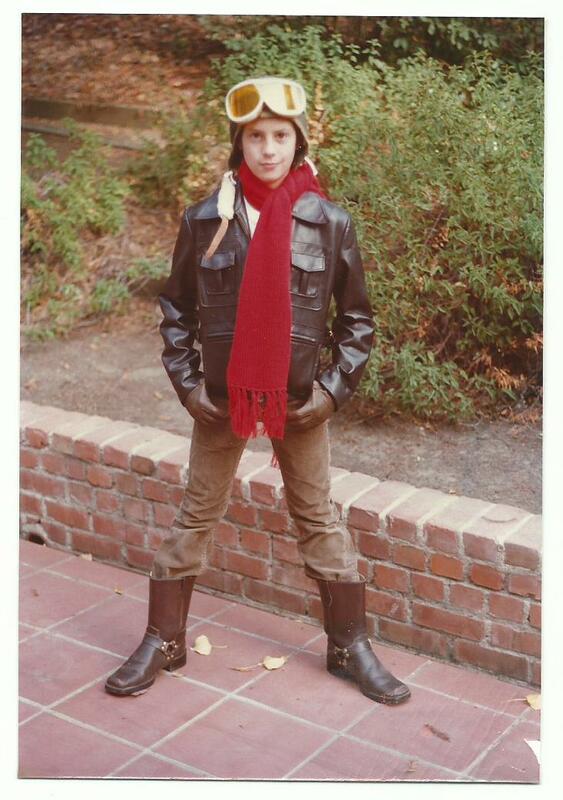 Me in 1978 with my pilot’s gear on. When I was young and still under the illusion that I could do anything I wanted, I dreamed of flying airplanes. The idea seemed exiting and liberating, and the airplanes themselves were shiny and sleek and powerfully beautiful. So when I was given the glider flight as a gift a few years ago, I was stoked. This was going to be great, I told myself. My wife and I drove to the airfield on a clear autumn day. We checked in and showed our gift certificates. After the pre-flight briefing, we were shown the two-seat training glider in which we’d each go up separately, with the instructor. When it came to be my turn, I was excited as I climbed into the cockpit and put on my headset, letting the tow plane take us aloft. But it became clear to me that day that I don’t have what it takes to be a pilot. You could say that I didn’t give it a fair try, that I should have put more effort into it if I really wanted to fly. But let’s not confuse interest with aptitude. It was unambiguous that I don’t have an innate ability for flight. To pursue it would be to insist on doing something that I’m not good at. That would make me vulnerable to the Dunning-Kruger effect. I could think I was a great pilot while actually suffering the fate of all incompetent pilots when I eventually crash my plane. An aircraft is not the place to have delusions of competence. After we landed, I could feel my boyhood dream fading in the harsh light of reality. There’s a reason people don’t have wings. Most of us just aren’t cut out to be anything more than pedestrians. I like airplanes to this day. I just no longer believe that I should be the one flying them. “Why don’t you go to any professional development seminars?” my boss asked me once. She wasn’t just my supervisor; she was the division head. Since our division was relatively small, I had frequent interaction with her. Rarely did she ask such a pointed question. I mumbled some reply and moved on to another subject. But it was a valid question. I had done little in the way of career development training and it left me with a vague feeling of dissatisfaction. And now I know why. I didn’t know what career I was in. Back in 1994, I joined a journalism organization with the intention of becoming an environmental journalist. Think Bill McKibben. I started as a researcher but figured that, before too long, I would be able to move up to more prominent writing positions. Years went by, however, and I ended up not doing much journalism. I am partly to blame for that because I was, I now realize, ambivalent about journalism in general. In college, I worked on my student newspaper but never took a journalism class. After graduation, I tried to write for newspapers, but never applied for a staff position. Writing held an allure for me, but pursuing journalism for its own sake–all that interviewing and beat reporting–did not spark my interest. After college, I saw two paths to where I wanted to go. One was that of the environmentalist who was also a writer. The other was the journalist who specialized in the environment. I preferred the former but left myself open to the latter if the right opportunity presented itself. I once asked an editor whether he was looking for the environmentalist writer or the specialized journalist. “Journalist,” was his answer. I was dismayed because I did not believe that journalism was the only path to being an effective writer. In the area of nature and the environment, some of the nonfiction writers who I admire the most–Annie Dillard, David Gessner, John McPhee–do not consider themselves journalists at all. * And in spite of that–or because of that–I feel they have contributed the most to the conversation. Not needing to fit into the constraints imposed by modern-day journalism, they are free to push the boundaries. Journalists appear to believe that they have exclusive access to the facts, and that writers who are not journalists are sloppy or unable to grasp the story. Journalists act as members of a club–the Fourth Estate and all that–and consider writers to be wannabes lingering around the fringe. (Writer Joan Didion refers to “the contempt for outsiders” in her article about journalists and the political types they report on.) Needless to say, I disagree. To many people, the terms “journalist” and “writer” are interchangeable, which is not surprising since the majority of the current generation of writers came up through the ranks of journalists. But it’s worth asking whether that was just a historical coincidence. Today, when news is published on what one writer calls “the vaguely Soviet-seeming syndication-fed news pages,” journalism and real writing seem to be drifting further and further apart. Frankly, journalism as a career path for a young writer is dying. The website CareerCast, in its annual Jobs Rated report, lists newspaper reporter as the number one worst job in America in 2013. “The opportunity to climb the [career] ladder disappeared,” says one reporter who was interviewed. Furthermore, according to one recent poll, only 28 percent of the public think of journalists as contributing a lot to society’s well being. This does not make for an enticing career choice. The writing I’m interested in is less about a recitation of the facts than the finding of greater truths. To do that, writing must have a strong voice and an informed point of view. Journalistic objectivity doesn’t allow for either of those. I’m no longer afraid to make known my lack of journalistic ambition. Journalism is not my career, and being around journalists day after day has not provided the professional development that one would expect from over 15 years on the job. I’m not entirely sure where I’m headed, but I’m sure of one path to avoid. *McPhee, in a piece in the July 2, 2012, issue of The New Yorker, refers to himself as a “writer of long fact” and that he teaches “factual writing.” Another writer who I deeply admire, William Langewiesche, studied anthropology in college and “does not want to be viewed as a straight news reporter” according to one interview.